Many of the designers I worked with in the past have then gone and worked on first mock-ups of the home page and a product page – nicely designed and with a bit of flash here or there – which they then sent to the client to get feedback and develop a new or final draft of these pages. And then they went off and started developing the website, without much (or any at all!) time spent on the information architecture or usability (and accessibility) of the client’s website. In today’s article I want to go through a couple of best practice approaches to information architecture and usability for Business-to-customers (B2C) websites. To start off, I would like to let you – the reader – know that I will not quote Jakob Nielsen’s Usability Heuristics. I am writing about how to apply them to the industry I have been working for over the last couple of years, and I feel that it is necessary to step away from these ‘heuristics’ and use your own head and apply them based on the industry you are working for.Right, let us get right to it. A sitemap is a very holistic and flat version of a website that can show the client how you would like to approach the different browsing routes to a project. The idea here is to plan out exactly what pages you will need to then build the whole website. How does the destination route working? How does a user get from reading a news article on the website to a related product? Where to search results lead the user to, and where do they come from? On the right (click on the image to enlarge) you will see a snippet of a sample sitemap that I have prepared for a recent client of mine. 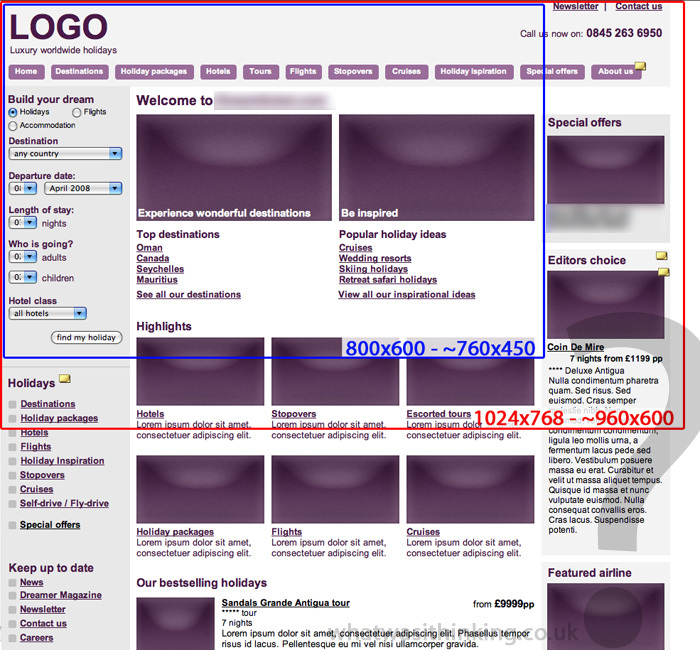 These “multi-coloured squares” represent different sections within a website (in this example the purple section defines a destinations-route, from a country page down to the product, its detail pages and lastly a link to the booking process). Each page links to another one (or different ones), to describe possible routes of a user to get from one page to the next. Obviously you do not have to create a sitemap in Photoshop, if you have Excel you can do the same, not as pretty, but it does the job. Colouring different sections makes sense simply because it makes it easier for a client (and yourself!) to make sense of each section – and ultimately it makes sense for quoting and pricing as well later on, for example if a client wants you to add more information, or if you need to put costs down. A sitemap does not necessarily mean that you will be needing all these pages: you might for example have set up the product to be displayed on a number of pages, overview, gallery, technical features and prices for example. However, during later stages it could be that there is just not enough information for that many pages, and it could just be that most (or all) of the information is on one page! After a sitemap you can always go and work on the designs already. However, when it comes down to working on corporate B2C or B2B sites it makes sense to step into the shoes of an information architect and specify the pages prior to designing and developing the website. And information architect’s role is to go and specify the pages of a website following both the research carried out onto the target market and the products and the competitors of the client as well as the best practice approach to allow the user to get to the product of the website with all of the information he / she requires to make a sophisticated decision whether or not to buy the product. As the information architect you are now in the unique (but difficult) position to specify a best practice approach to selling a client’s products. Effectively, you are going to be working on a blueprint of a website. Similar to the architect’s role of drawing out a blueprint of a house his client will be living in you are working on a blueprint of a website your client will be expecting to sell to his users. The tools for making a blueprint depend entirely how accurate you want to make it. I have seen prototypes done in Excel , Powerpoint or Visio for example. I prefer using a program called Axure RP4. It helps me create annotated wireframes, navigational flow charts and even generates an HTML prototype to be viewed and tested by the client. On the right (click on the image to enlarge) you can see a thumbnail of a recent blueprint I made. Don’t be worried by the colour, I tend to use a uniform colour scheme to highlight the fact that this is in no way final graphic design and that it shows just a proposed approach to the functionality and navigational flow for the client’s website. To begin such a prototype it is best to have the sitemap in front of you, as this is the base of the number of pages you need to set up (see the left hand column of the screenshot) and to give you a clearer picture of how to get to where and which pages will require cross-links to each other. After you have set up the number of pages you require and maybe made a note on each on where you need to link to from here or what information this page needs to hold you should continue working on the navigation: whether you are either top navigation or side navigation (or both! ), you will need to consider how you want your users to interact with the website. Remember, in the Western world we are reading from left to right, top to bottom. Best practice is having navigational items (search functions, links) that affect the main content area on the left hand side (actually this blog would already be seen “bad practice” if it was a B2B or B2C website!) or the top part of the page. Your next step will be laying out the content for the whole of the page. To make your job easier I would advise you begin with the homepage (obviously) followed by the product pages and the main browsing route (be it “destinations” or “products and services” to name two cases). If you are building a new website for your client it is best to speak about for what resolution you are going to build the site. According to the browser display statistics by W3Schools we can see that beginning of 2007 only 14% of all users were still using a display resolution of 800×600, with January 2008’s figures are probably around the 11% mark for that resolution I would think. This means for us though that if we specify a prototype for a website on a resolution higher than 800×600 we are effectively running the risk of 14% of our target user base not being able to see a part of our website without having to use horizontal scrolling. Referring to the prototype screen shot above, I have built the website for a 1024×768 screen of above, but I made sure that the information on the right hand side can always be classed as additional information not necessarily required by the user to make an educated decision about whether or not to book a holiday with my client, with the same call to actions following both in the main area as well as the right hand side. Not only the right hand column may “suffer” on smaller displays, but so does the content of the whole website. Look at your browser window now, do you have any tool bars installed? Are you using your browser in full-screen or in a window? As a rule, try to put the most important information towards the top of the page. 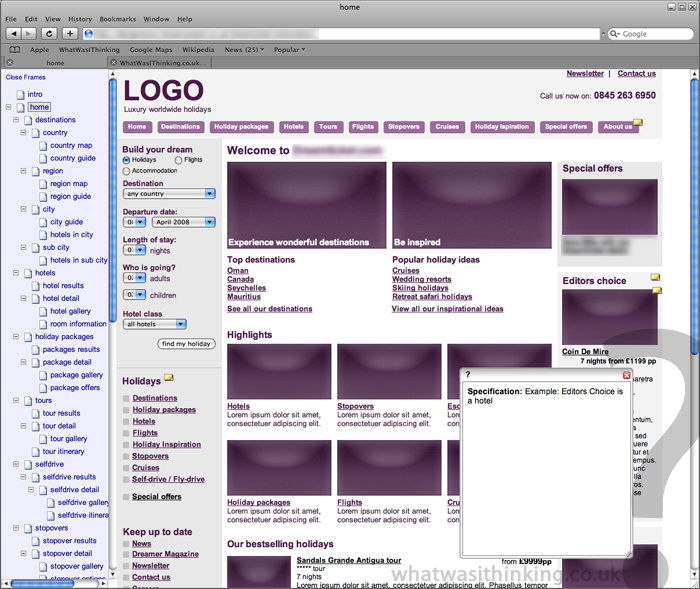 Looking at the screen shot to the right (click on the image to enlarge), users with different screen sizes will inadvertently see more – or less – of your website. As such you need to make sure that the most important browsing routes and products/offers are geared towards the top. This doesn’t go for the homepage only either, this is an important point to think about for the whole website with all its pages. I as a user am not interested in a site that shows lots and lots of big photos, but requires me to “work” to get to the content or navigational items to even get there. Does the homepage have all necessary items (search, featured slot, main browsing routes, and highlighted slots)? Does the browsing route (for example “Destinations route”) make sense? Is there enough information or featured items on each stage (country -> region -> city) to allow the user to make an informed decision if he / she hasn’t been to that country before? Do I know where I am and how I can get back to where I came from? Do I need breadcrumbs? Is there a clear call to action? Does it make sense? Does the search results page make sense? Can I filter it? How? Have I annotated all necessary items? Once you have worked your way through your list and it makes sense to you, you can then begin generating the prototype for a first preview. Business man, who has little time on his hands and needs to find a product quickly to see if it interests him at the first time of using the website, and who then later comes back to the website to read more about it. Make notes, write down what you – the user – liked and where you struggled finding your way to the product, or the way back to where you came from. Note down what did not make sense to you, be critical and compare your prototype to competitors’ websites. We have now finished with gathering information about the client, the brand, the products, the user base and the target market, and we have finished preparing and self-testing our first draft of the prototype. In part 3 I will discuss further user and usability testing as well as accessibility testing and how to deal with feedback from clients before we go to quoting, designing and development of the final website. Again, this was just a short run-down of this vast and complex subject. Some of the above may most likely be different from how you have learnt (or read up on) information architecture and accessibility and usability testing. To be honest with you, so have I when I first came into contact with the industry I am working for. You are working in an industry that is most likely not considered the “average website”, be it websites for the music industry or landing pages, B2B sites or what have you. The user base is sometimes entirely different, you can expect your users to be a lot more experiences in some industries, and maybe less savvy in others. Certain heuristics or standards may not necessarily apply. I am not telling you to go and use ‘my’ methods described above, this is just how I work, and it some of it may just not apply to you. At the end of the day, looking at your industry, your client’s requirements, the client’s competitors and its target market are what will give you the best ideas for approaching your project. [Update]: Part 3 of Information Architecture and User Testing is online! I’ve been working on a friend’s music / online-store and am beginning to build a prototype for it as well now. I am thinking about using iRise or Axure for that. Would you mind having a look at it when its done? I have worked on a prototype based on the client’s brief, but half-way during the project some of the routes to get to the product have changed with a requirement to increase sign-ups – once you did a search and want to go to the product page you are asked to register your details for example. I am a bit at a loss here, as the original brief was very easy to follow, and I am now struggling trying to make sense of the prototype, simply because I as a user don’t really want to proceed if that makes sense? I understand completely where you are coming from. In a nutshell, you have prepared a prototype you feel meets the client’s needs to great extent, yet you have now been told that the user’s navigation and flow is being hindered by data-capture methods to actually get to the information the visitor wanted to come for in the first place. I have been in these situations now and then. What I would do would be confronting the client at this stage and ask them exactly what their reasoning is behind stopping a user from accessing the exact information they came to the site for in the first place. Let the client know you understand the reasons for data capture to increase their mailing lists or to have a more accurate feel for their target market, but argue that their plan will fail due to the fact that you – as the visitor – would be stumped by needing to enter your details for information that may be freely available on other, similar sites, thus risking losing a great number of visitors (and potential customers) at this stage. Maybe suggest a different way. Depending on the project you could make certain items (such as technical specifications or downloadable information) only available if you filled in a small form. This is very normal, as a visitor you have plenty of information to go on with, and if you need a bit more in-depth information then you need to sign up. If that does not work due to the product then maybe it would help working on having a little “keep me updated” box on the product pages along the lines of “Would you like to receive more information and updates on this product? Please sign up here”, that might do the trick as well. Wow! Thank you very much for this post! Have you tried to simulate the situation of using the site with the client? If you have the time to do a mockup using a prototyper, that should be useful to show your point to the client.